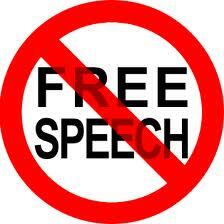 GOODBYE FREEDOM OF SPEECH IF OBAMA GETS ANOTHER TERM…. Not only will we lose our “Freedom of Speech” but there is an effort being entertained by the Whitehouse and the Justice (Injustice) Department to consider “Criminalizing Criticism of Religion” and the religion in point is ISLAM. Let me go further. Back in July Arizona Republican Representative Trent Franks asked Assistant Attorney General Tom Perez this simple question: “Will you tell us here today simply that this Administration’s Department of Justice will never entertain or advance a proposal that criminalizes speech against any religion?” Perez objected that there was “no context.” Franks asked the question a second time and Perez said “That’s a hard question… when you make threats against someone.” Remember that was not Mr. Frank’s question or assertion but that is the direction that Perez took it. Perez would never answer the question but danced around it all four times asked. Representative Franks was asking the question because Muslims are persuading American courts to consider Sharia law in making decisions, and prominent Muslim activists have openly declared that they want to “criminalize criticism of Islam” and follow Sharia law’s directive on how that person so charged would be punished. According to them “insults” against Islam is blasphemy and the penalty for that is death! Is that frightening or what? Perez and other officials from the Justice Department attended a meeting at George Washington University where an Egyptian-American (despise the hyphenation you are either American or you are not) lawyer was suggesting criminalizing speech against Islam. Then top Justice Department officials had a meeting where they invited Islamist advocates who want the Justice Department to make a legal declaration that any U.S. Citizen who criticizes Islam would be charged with “racial discrimination.” Now understand you can criticize Baptist, Pentecostals, Catholics, Jews or virtually anybody else but not ISLAM. The lawyer Sahar Azia, a female said: “The department’s ‘civil rights lawyers are top of the line’ I know that they can come up with a way to redefine criticism as discrimination.” Aziz the said, “I’d be willing to take a shot at it.” This is under consideration by the Department of Justice and the Whitehouse. I call that a complete violation of the Constitution and Treasonous. Muslims who came to America “legally” to escape the discriminatory and cruel laws of Sharia have pleaded with the courts to afford them “equal protection under the laws and not subject them to the inhumane Sharia.” There have been over 50 cases thus far in which Sharia Law was deemed allowable in the U.S. courtroom. HOW COULD THIS HAPPEN? Now what does this mean to you and me? If Obama does this it will happen via Executive Order and an end run around the Constitution and the Legislative Branch. It would mean that this so-called “blasphemy law” would be in force and would effectively put an end to any resistance to jihad because we would all be muted and thus defenseless against its onslaught. (If this happens then if you want to talk to me or visit me you will have to do so at the local federal prison if they let me live which, is doubtful.) I’m sure some of you are thinking, surely the First Amendment will prevent this. NOPE! Enforcing the First Amendment is dependent upon those whose charge is guarding, protecting, and upholding it. When you have a President and DOJ that wants to do away with it you are up the proverbial creek without a paddle. It would make the First Amendment virtually void as is the Second Amendment in many parts of the U.S. today. Folks, I cannot stress enough how critical it is to defeat Obama and removed the man and his bunch from Washington! Getting good people in Congress is NOT ENOUGH we have to rid ourselves of this plague in the Whitehouse and the infectious poison that he is injecting into our society. Whatever we do we must vote in such a way as to OUST OBAMA in November. If we don’t there may well be an Islamic Flag flying over the Whitehouse as they have declared will be.